Labour Party leader Jeremy Corbyn has promised to bring back nursing student bursaries 'straight away' if his party wins Thursday's general election. Mr Corbyn made the pledge in a video posted on the Channel 4 News Facebook page this week, which has been viewed 1.2 million times since it was uploaded on 3 June. Bursaries for nursing students will be replaced in August with tuition fees and student loans. The Conservative government said in 2016 that the changes would help fund more training places by 2020 and provide students with around 25% more financial support. What if there was no bursary? Mr Corbyn said: ‘I met a group of trainee nurses at University of Worcester; there’s a very good school of nursing there. ‘I said to them: "If you weren’t getting the nursing bursary would you still be doing this course?". Only one said they could possibly just about manage it. ‘All the others said: "Look, I’ve got children, my husband and I just about manage to pay the mortgage, but I could not afford the fees on top of that.". ‘I asked one student: "What would you do if you weren’t doing this?". She said: "Go back to working in Tesco.". ‘Well that’s fine, working in Tesco, good, it’s a job, good, well done. ‘But she wanted to be a nurse and because of the nursing bursary she can be a nurse. And you know what? We are all going to benefit from that. 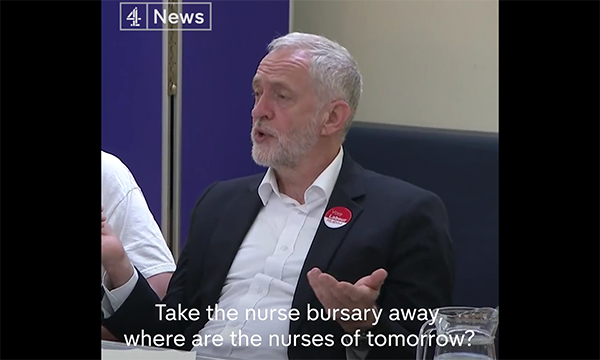 Mr Corbyn had also pledged to restore bursaries – as well as scrap the 1% cap on pay rises for all NHS workers – when he appeared at RCN congress in Liverpool last month.